Easy to assemble and packs away for easy storage. The frame is manufactured from strong-coated steel tube, the cover is made of a strong reinforced plastic (U.V. stabilised). 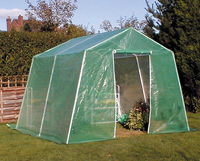 The twin zipped door gives easy access to a spacious growing area. The large rear window is fitted with insect net.